It takes neither the salary of a pro athlete nor the commitment of an Olympian to wrangle the sports equipment that accumulates this time of year. 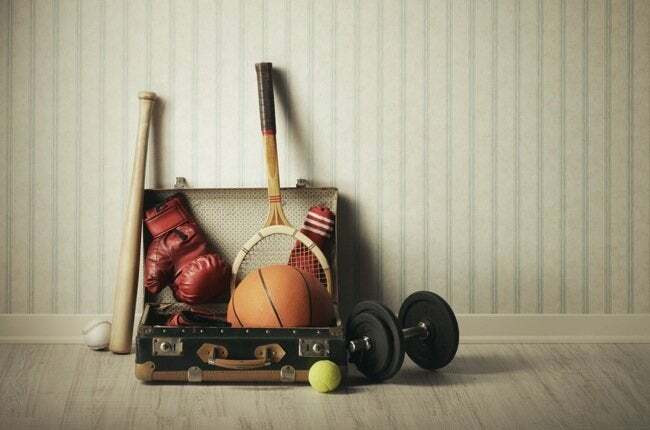 Summer brings flowers and sunshine, but it also has a way of dragging outdoor sports right into your front hall. Fortunately, there are a lot of ways for homeowners to get things under control for little money, and with a minimum of elbow grease. Start with these five ideas. Relocate sports storage from your front door area to the garage, where your family members can easily retrieve or replace whatever they need upon exiting, or climbing into, the car. Bungee cords, scrap lumber, and existing studs make for a readymade framework to organize bicycles, skateboards, tennis rackets and other miscellaneous pieces. 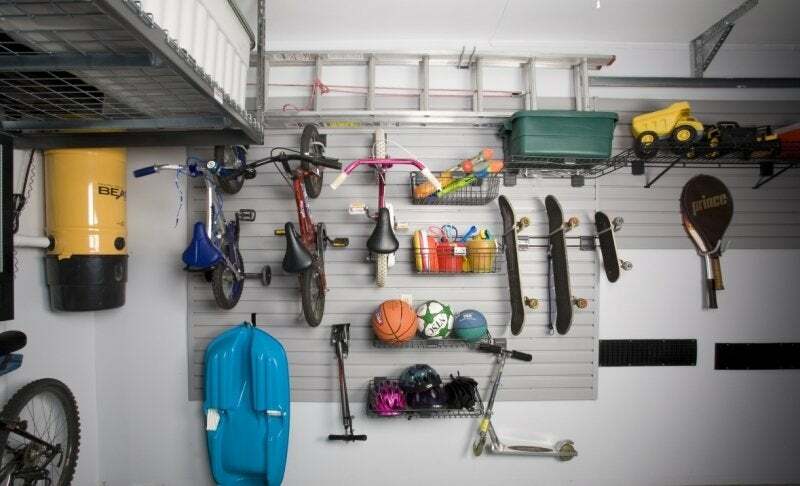 Alternatively, choose from a vast selection of retail garage storage systems. 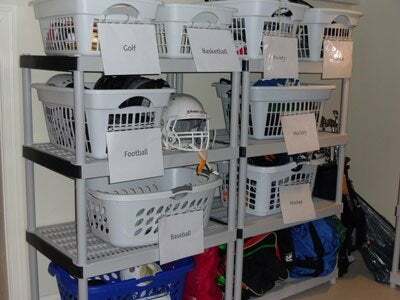 One of the cheapest and easiest ways to create instant sports storage is by applying homemade labels to heavy-duty laundry baskets. Place the baskets on built-in or modular shelves wherever you can spare the real estate. As they’re returning from the field, your family members can toss their things into the appropriate baskets. Of course, each family is different, so consider whether labeling the baskets by sport or by family member makes the most sense in your household. 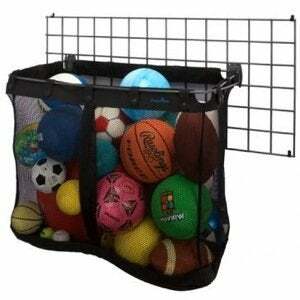 A no-frills organizer is perfect for families in which several members participate in different summer sports. Choose whether to set yours up in a central location or an out-of-the-way corner. When the season is over, collapse the assembly and store it until next summer, or swap in skiing, hockey, and ice-skating gear. Wall-hung baskets systems have become increasingly popular options for storage around the house, be it in the bathroom, mudroom, laundry room or even the entry hall. Shop online or visit your local home improvement center or hardware store to find an inexpensive, ready-to-install system, one that fits neatly into the space you have available. 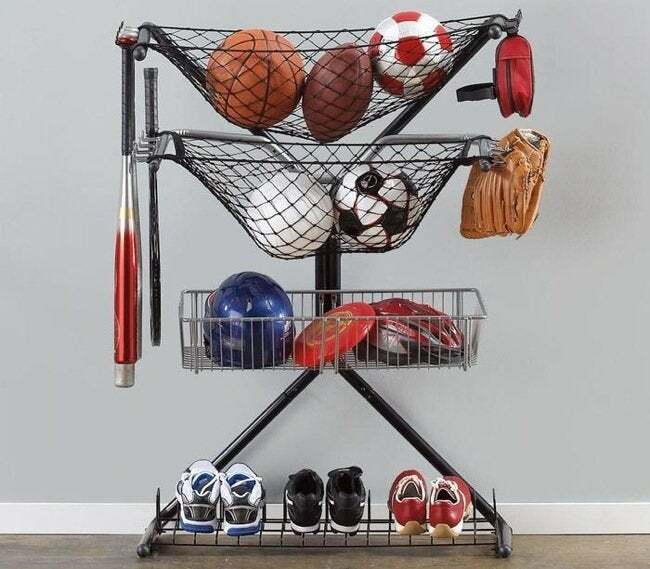 Slidable hooks in combination with mesh or wire baskets enable you to customize sports storage for the specific needs of your family. The feature I like best is that each basket’s contents are clearly visible, which means I don’t have to waste time digging around in search of that elusive lacrosse ball. Get soccer cleats and roller blades off the foyer floor, where they are not only unsightly, but also a tripping hazard for family members and guests. Use hooks, rods, bins and shelves to transform a closet into a sports storage zone that’s out of the way of both eyes and feet. A basket on the inside of the closet door works well as a holder for awkwardly shaped items, such as helmets, while hooks fixed to the rear wall keep field hockey sticks and golf clubs in place. If there’s no better place for them, put balls on the closet floor, nailing a two-by-four across the foot of the space in order to keep them from rolling out the door. Oh, and remember to add some air freshener or potpourri to mask the inevitable odors!